Pollinator Week is June 19–25, 2017: bee knowledgeable! Bees are the most important pollinators of California agriculture—helping us grow field crops, fruits, nuts, and vegetables. Honey bees receive most of the credit for crop pollination, but many other kinds of bees play an important role as well. There are 1600 species of bees in California! Take time during Pollinator Week to learn about the different kinds of bees and what you can do to help them flourish. Why should I care about other kinds of bees? Bees other than honey bees contribute significantly to crop pollination. For example, alfalfa pollination by alfalfa leafcutter bees is worth $7 billion per year in the United States. Other bees can also boost the result of honey bee pollination—in almond orchards, honey bees are more effective when orchard mason bees are present. The more bee species, the merrier the harvest! While growers often rent honey bee colonies to pollinate their crops, some wild bees pollinate certain crops even better than honey bees do. For instance, bumble bees are more effective pollinators of tomato because they do something honey bees do not: they shake pollen out of flowers with a technique known as buzz pollination. Likewise, native squash bees are better pollinators of cucurbits—unlike honey bees, they start work earlier in the day, and males even sleep in flowers overnight. How can I help honey bees and other bees? When it comes to land management and pest management practices, some bees need more accommodations than others. That's why it is important to know what bees are present in your area and important to your crop, and plan for their needs. Use this bee monitoring guide from the University of California to identify the bees present on your farm. You can help all kinds of bees by using integrated pest management (IPM). This means using nonchemical pest management methods (cultural, mechanical and biological control), monitoring for pests to determine whether a pesticide is needed, and choosing pesticides that are less toxic to bees whenever possible. Check out the UC IPM Bee Precaution Pesticide Ratings to learn about the risks different pesticides pose to honey bees and other bees, and follow the Best Management Practices To Protect Bees From Pesticides. Bees also need plenty of food to stay healthy and abundant. Plant flowers that provide nectar and pollen throughout the year. See the planting resources below to find out which plants provide year-round food for specific types of bees. Like honey bees, native bees need nesting areas to thrive. Bumble bees, squash bees, and other bees nest underground. Ground-nesting bees may require modified tilling practices (such as tilling fields no more than 6 inches deep for squash bees) or no-till management to survive. For aboveground nesters like carpenter bees and mason bees, consider planting hedgerows or placing tunnel-filled wooden blocks around the field. See the habitat resources below for more information about native bee nesting in agricultural areas. Insect Pollinated Crops, Insect Pollinators and U.S. Agriculture: Trend Analysis of Aggregate Data for the Period 1992–2009. Honey bees are more effective at pollinating almonds when other species of bees are present. 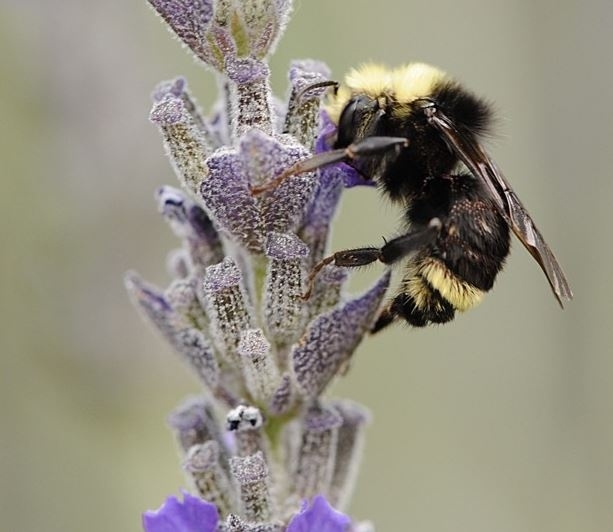 The Vosnesenky bumble bee on lavender. Photo by Kathy Keatley Garvey.